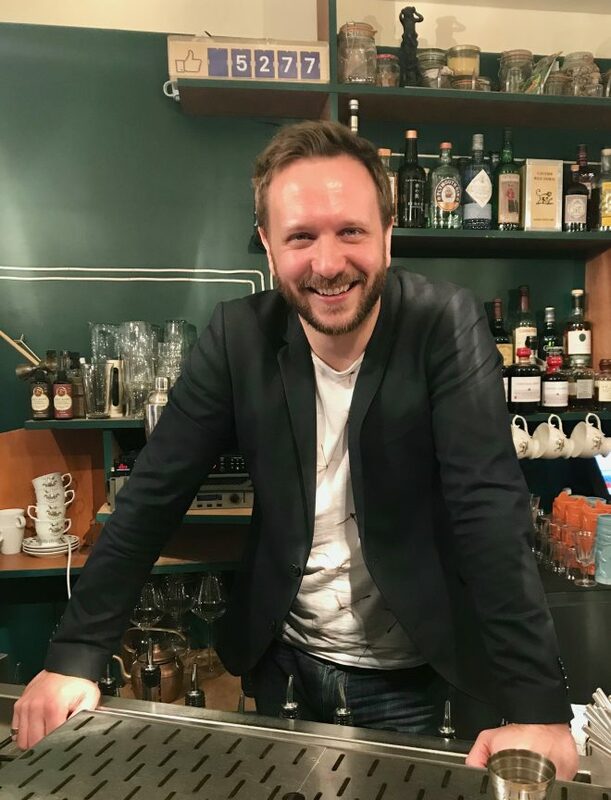 I am Nicolas Blanchard co-owner of L’Heure du Singe and I am a bartender for the last 8 years. I used to be a carpenter, but after ten years, I was looking for something more social. I started to travel and in Manchester, I learnt hospitality and how to tape beer or make cocktails. After 2 years I came back to France in Paris when cocktails became trendy and started a bartender position in La Conserverie for 2 years where I’ve improved my technic. That’s where I met Morgane before we decided to open our own place. In Toulouse, where I came from, there was no strong offer, even if a market existed, so we moved there. We were looking for a brand identity, with an animal. In the 30’s my great-grandmother owned a bar in Toulouse named Bobby bar. In the bar, there was a living monkey named Bobby. So we’ve imagined that the monkey left after the bar closed, during the Second War World, and travelled to learn English, culture and cocktails. Now that’s the time of its come back. So we open L’Heure du Singe (Monkey Time), a local bar with sharp cocktails made with local products, including wine and beers. We try to work with small producers and organic seasonal fruits. My dream bar would be an itinerant pop up bar, where we would have artists, musicians, chefs or other bartenders to share a real 360° experience with the customers. So more a platform than a real bar. Music would be more hip-hop, funk or disco. The food would be a mix of finger food and real dishes. The idea would be to make you forget that you are in a bar, but just to make you feel good. I go a lot to restaurants or my wife cook at home while I make cocktails. So it’s a lot about food and drink. When we have more time, we travel to chill and at the same time visiting other cities, like last year in New York. Rum is versatile, so that’s easier for business because you can make a drink that anyone will love. That’s why I used any type of rum, from agricol rum to white rum. First, the way you welcome people and how you are going to introduce the cocktail, especially the concept you try to develop around it. Then you need to understand what the customer wants and make him comfortable even if you can surprise him a little bit. A the end of course balance. I love to use fortified wine like vermouth, port or sherry. They are complex but everyone knows them and they can really twist the cocktail. You need to go to the Dead Rabbit in New York, especially for the service, or Happiness Forgets in London. Totally different, in Sanlucar de Barrameda in Andalusia, a local place named la Taberna der Guerrita where you can find a lot of local products. Of course where we get married, le Mary Céleste in Paris. It’s casual and sharp at the same time with a real personality.